MBM Destroyit HDP0102 Degausser/HDP The MBM Destroyit HDP0102 Degausser/HDP is a dual unit degausser and hard drive punch, both incorporated into one powerful machine. The HDP0102 takes the user through a series of steps in order to obtain accurately degaussed and punch hard drives that are made unreadable. A used hard drive is dropped into the slide-out drawer and the drawer is closed for the degaussing process to start that takes up to 60 seconds. Once the drive is completely erased, it is removed from that cabinet and placed into the HDP feed chute for punching. After the punching process, that can clearly be seen by the user, the slider level allows the user to drop the hard drive into the collection bin for disposal. This simple process takes little time but the hard drive degausser delivers exceptional outputs. The user can be at ease that the information has certainly been destroyed and cannot be used against them at any point. 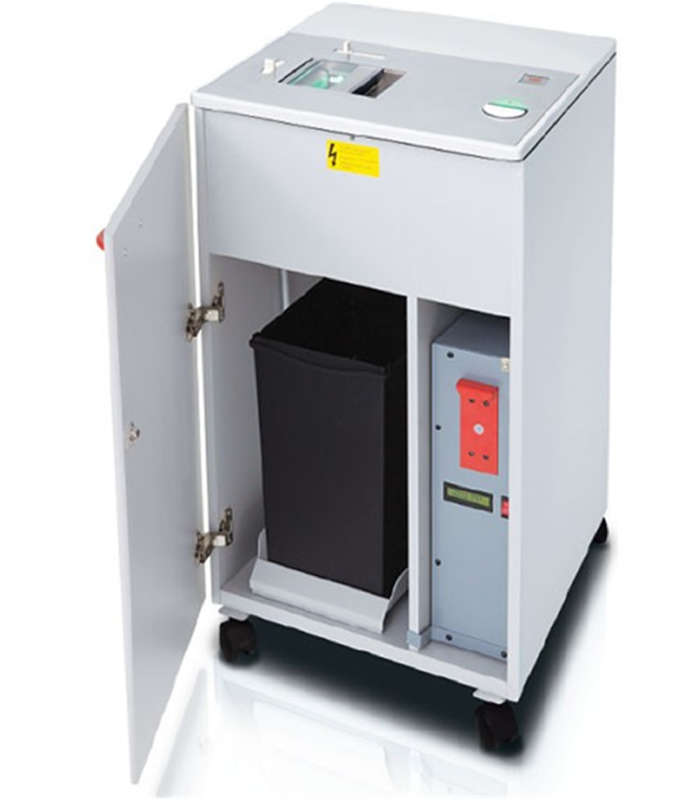 Facilitated by the SPS (Safety Protection System), the HDP unit is electronically controlled with a transparent safety shield placed at the feed opening. The Easy Switch control element of the hard drive destroyer uses color codes and back-lit symbols to indicate operational status of the HDP. With 1 year warranty on all parts, excluding wearables, the Destroyit HDP0102 Degausser/HDP is the ultimate solution for professional settings. Dimensions (D x W x H) 18.5" x 19.5" x 33.5"
Erasing Area (D x W x H) 6" x 4 1/4" x 1 1/2"